Lauren Hartke is the body artist of the title. A performance artist, she is married to film maker Rey Robles who shortly after we are introduced to him, drives to his first wife’s house and kills himself by way of gunshot wound to the head. Staying on at the rented beach side holiday house they had been temporarily living in, Lauren becomes mired in her grief, drawing in on herself, isolating herself. Until one night she happens upon a stranger in the house with her, a stranger who happens to be able to speak in Rey’s voice and recall whole conversations between Lauren and Rey leading up to the day of his death. …she let out a groan, but not really every time, that resembled a life lament. I really had trouble reading past this first part. There is a forced feel about this mundane ritual that immediately left me cold. A widely lauded post-modern author, DeLillo use of language is brought to bear heavily on this couples morning ritual perhaps to elevate it beyond what it was, but only inducing eye rolling in me. But at just shy of 130 pages, I decided to push on and while the rest of the book improved for me, my opinion is a mixed bag. The reader is delivered the news of Rey’s demise via a news article, perfunctory and concise, filling in a few more details of Rey’s life as per any regular obituary article. But this is where the clear and straight-forwardness ends. We are then plunged into Lauren’s grief, returning to her in their holiday home, the perspective flicking back and forth between first and third person. The reader is privy to Lauren’s thoughts and like anyone’s personal thoughts, there are non-nonsensical leaps and turns that are dream-like and at times, hard to follow. When a young stranger suddenly appears in one of the rooms in the house, his arrival is not startling, but inevitable her instincts having known there was someone always there. This stranger, whom she names Mr Tuttle after one of her teachers, is childlike in appearance and capabilities but has the unnerving ability to parrot past conversations with Rey, mimicing his voice and his side of the conversation. I struggled to understand the significance of Mr Tuttle beyond the obvious; he is a representation of Rey one that Lauren can care for, nurse due to his childlike state. Why shouldn’t death bring you into some total scandal of garment-rending grief? Why should you accommodate his death? Or surrender to it in thin-lipped tasteful bereavement? Why give him up if you can walk along the hall and find a way to place him within reach? But his utterances are confusing too; repetitive and making little sense. Is this to reinforce his childlike fragility? He isn’t a total blank space for her to write Rey into, so again confusing and distracting in its oddness. I went to have a look at some other feelings about this book from other readers on Goodreads, as I was feeling a little like a lot of this book went over my head and maybe my feeling of inadequacy led to my dislike of it. However, there is the general feeling that it is deliberately vague and “hallucinatory”, leading to differing opinions of what the story actually is even among the literary reviewers. While this appealed to some, I can not count myself among them. 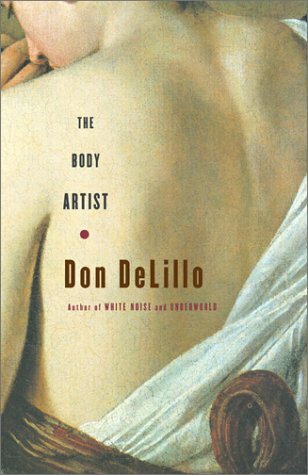 I found the ideas and the tone of this book quite personal to DeLillo himself, a creation of art that is particular to his specific vision and thus making it not accessible to everyone, but then in leaving it to taste, not something that will be enjoyed by many also. I did have to laugh at one reader addressing DeLillo as “you post-modern gargoyle of unmeaning“. And I agree; I think his unmeaning was the undoing of my enjoyment.